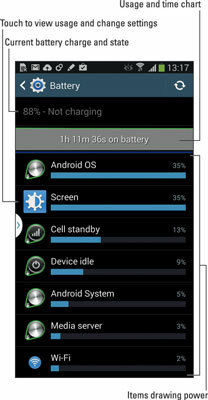 Android phones display the current battery status at the top of the screen, in the status area, next to the time. The icons used to display battery status are similar to the icons shown here. You might also see the icon for a dead or missing battery. 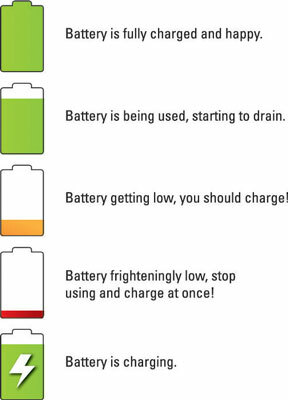 Heed those low-battery warnings! The phone sounds a notification whenever the battery power gets low. The phone sounds another notification whenever the battery gets very low. When the battery is too low, the phone shuts itself off. In addition to the status icons, the phone’s notification light might turn a scary shade of red whenever battery juice is dreadfully low. The best way to deal with a low battery is to connect the phone to a power source: Either plug the phone into a wall socket, or connect the phone to a computer by using a USB cable. The phone charges itself immediately; plus, you can use the phone while it’s charging. The phone charges more efficiently when it’s plugged into a wall socket rather than a computer. You don’t have to fully charge the phone to use it. If you have 20 minutes to charge and the power level returns to only 70 percent, that’s great. Well, it’s not great, but it’s far better than a 20 percent battery level. Battery percentage values are best-guess estimates. Just because you talked for two hours and the battery shows 50 percent doesn’t mean that you’re guaranteed two more hours of talking. Odds are good that you have much less than two hours. In fact, as the percentage value gets low, the battery appears to drain faster. Dim the screen. The display is capable of drawing down quite a lot of battery power. Although a dim screen can be more difficult to see, especially outdoors, it definitely saves on battery life. Adjust screen brightness from the Settings app, or choose the Brightness quick action from the quick actions drawer. On some Samsung phones, the Sound item is found by choosing the Device tab in the Settings app. Most phones lack a single setting for vibration. Instead, you’ll find settings such as Vibrate While Ringing, Vibration Intensity, and Vibrate on Touch. Disable one or all of the vibration settings. Additionally, consider lowering the volume of notifications by choosing the Volume option. This option also saves a modicum of battery life, though I’ve missed important notifications by setting the volume too low. Deactivate Bluetooth. When you’re not using Bluetooth, turn it off. Or when you really need that cyborg Bluetooth ear-thing, try to keep your phone plugged in. Turn off Wi-Fi. The phone’s Wi-Fi radio places only a modest drain on the battery. Disable it only when battery life is critical; otherwise don’t fret over the Wi-Fi setting. Get a bigger battery. Most Android phones have larger batteries available as an option. The nice people at the Phone Store will be more than happy to sell you one or more, if you please. Having a larger battery definitely increases the time you can use your phone without having to recharge. If you buy a larger battery — or any replacement battery, for that matter — ensure that the battery is manufacturer-compatible with your phone. Improper batteries can damage your phone. Heck, they can catch fire. So be careful when choosing a replacement battery. Manage battery performance. Several Android phones have battery-saving software built in. You can access the software from a special app or from the Battery item in the Settings app. Similar to your computer, battery-performance management involves turning phone features on or off during certain times of the day. Third-party battery management apps are also available at the Google Play Store.